With nine new product launches in just three years, a subtle observer might say that Kia is on a roll. But calling what they're doing a complete revitalization of the brand would be selling their efforts short. The manufacturer is experiencing unprecedented sales success, and it's because they seem to be selling exactly what America wants right now: fuel-efficient, reasonably priced vehicles filled with tech and comfort features. The fact that their design team is hitting back-to-back home runs doesn't hurt either. 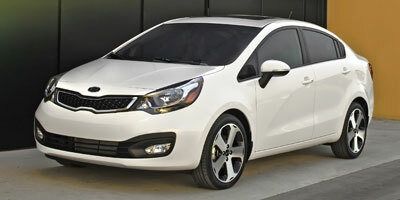 The Rio 5-Door is yet another completely redesigned vehicle from Kia. Really, the only thing left from the last-generation Rio is the name. New styling – inside and out – brings it into the 21st century, while a 1.6-liter engine is high on efficiency. That, plus a number of thoughtful modifications, helps the Rio return 40 mpg highway as well. The B-segment – what we call the sub-compact class – is growing steadily, and this Kia has considerable company from the likes of the Ford Fiesta, Honda Fit, and Chevrolet Sonic. The segment is too chock full of great cars to call out a winner, but with the Rio, there's no doubt that Kia will continue to improve brand recognition and garner sales. Fuel economy is stellar, and unlike some other sub-compacts, the Rio doesn't need a more expensive economy package to hit the magic 40 mpg highway number. Standard USB and aux jacks are a welcome bonus. For this segment the seats are particularly comfortable. The volume leader EX trim is well appointed for the price. Rear headroom is surprisingly spacious. As usual, the 10-year/100,000-mile warranty is a segment leader. It's a sub-compact car with a small, efficient engine, and yet we’re shocked at how sluggish the 1.6-liter can be with the automatic transmission. Legroom in the rear is good, but it's not best in class. While there are a decent number of standard features on hand, the base model LX is somewhat bare bones. Sub-compact cars used to be known as econoboxes – poorly driving, basic, A-to-B vehicles. Not so anymore. The Rio is comfortable, with body-hugging seats and a roomy feel inside the cabin helped along by an optional adjustable seat height and a tilting/telescoping steering wheel. Drive quality leaves the old econoboxes in the dust too, with the Rio feeling competent on the road, controlled in corners, and subdued over uneven surfaces. There’s a bit of road noise, and we’d be lying if we said the 1.6-liter engine was a strong performer. It struggles up steep hills and you won’t be passing many cars with it, thanks to the automatic transmission’s overreaching gearing. Manual mode helps to remedy the situation a bit by letting you control the gear changes. The Rio comes with an Active/ECO drive mode, which encourages fuel efficiency by slowing downshifts and increasing upshifts but dulls the drive experience. Not interested? Just press a button to deactivate it. At its initial launch, the Rio 5-Door will be powered by a 1.6-liter four-cylinder GDI engine with 138 horsepower and 123 lb-ft of torque, a higher output than many competitors. Most will also be fitted with a six-speed automatic transmission with manual mode. LX buyers can also opt for a six-speed manual, which has hill start assist at the ready to keep the Rio from rolling back on inclines. 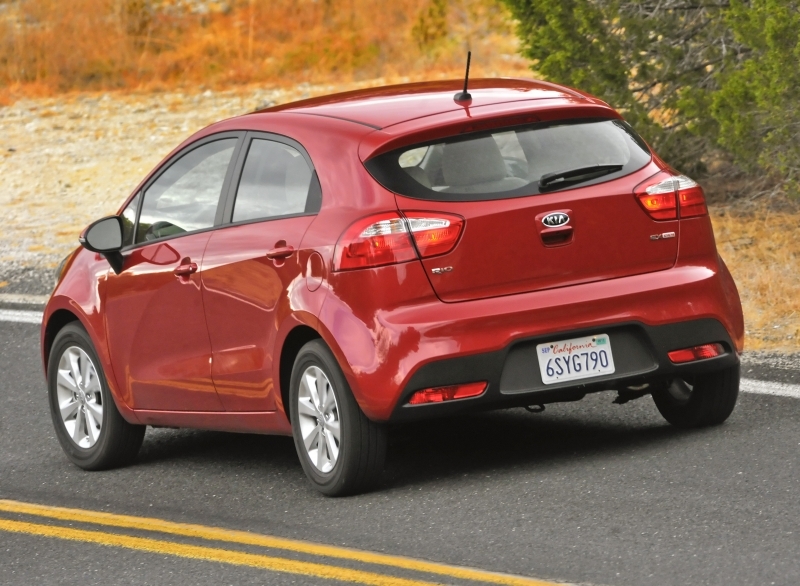 The Rio represents the pinnacle of fuel efficiency for a non-hybrid sub-compact. At 30 mpg city and 40 mpg highway, it's among the best in the segment, and it reaches those numbers without the use of a fuel economy package like some manufacturers offer. Helping its green cred are front and rear spoilers, an efficient engine, and low-rolling resistance tires. Kia has also made available an optional Idle Stop and Go system. It turns off the engine when the car is at a stop, keeping fuel consumption down in the city. 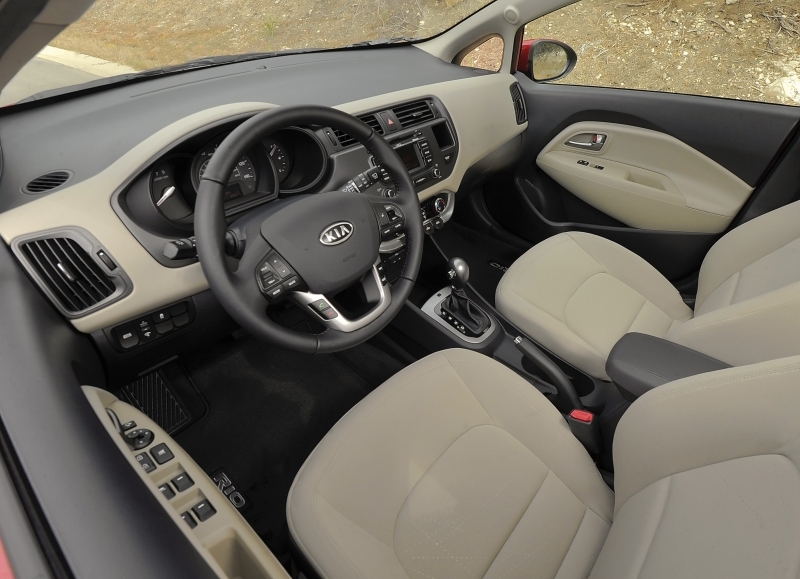 Appealing to all of the techies out there, Kia has set satellite radio capability and USB/auxiliary jacks as standard. The base system fully integrates connected mp3 players too. The EX trim has many more comfort features like a tilt/telescoping steering wheel (a must for a vehicle this size), sliding armrest, steering wheel-mounted controls, and Bluetooth in-car connectivity. A UVO infotainment system is housed within a 4.3-inch touch screen and includes a rearview camera and voice activation. Navigation is available in the Premium package, and a 350-watt Infinity audio system with eight speakers is a highlight. The Rio’s dash is simple and clean, with few buttons and knobs. Soft-touch materials are interspersed with harder surfaces to give texture and pliability to the front cabin space. For a car at this price, the fit and finish is high quality and there’s a good amount of storage space in the rear. 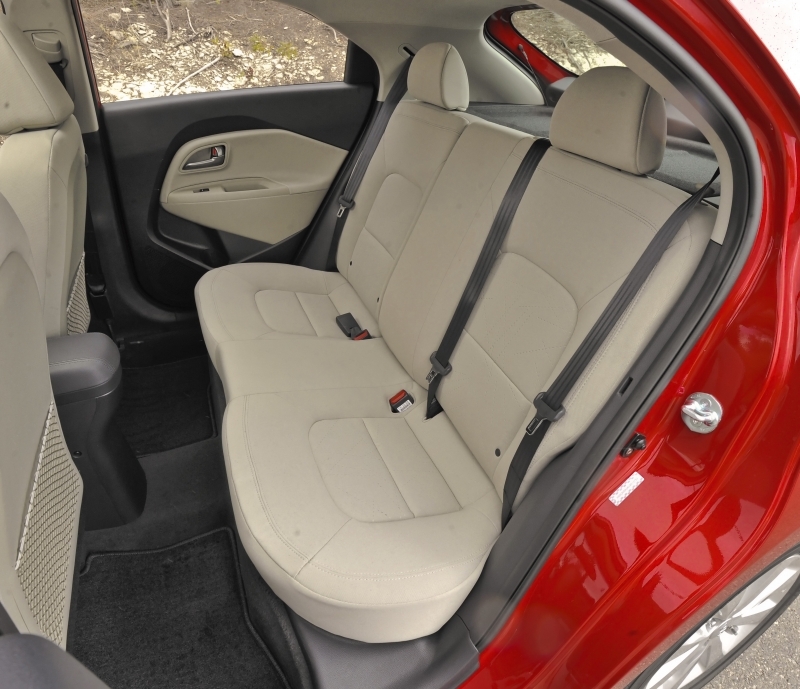 Legroom for rear seat passengers can be tight, but considering size of the Rio, headroom is plentiful. Within the segment there's not a lot of room for outside-the-box body styles. That said, we think the Rio is particularly good looking for its class. LED headlamps and taillights (on the SX trim only) are eye-catching, and the sweeping bodylines keep it looking modern. It has a familiar feel to it, thanks to the Kia grille, but the wide (almost bulbous) front bumper gives it a unique look. Lower, longer, and wider than the outgoing model, the 5-Door is 10 inches shorter than the Rio sedan. Sharp paint colors like electric blue and chestnut brown are standouts. How tight is this segment? The Toyota Yaris, Honda Fit, Ford Fiesta, Mazda2, Chevrolet Sonic, and Hyundai Accent are all worthy mentions in the sub-compact category. Every one of them has a different set of features to offer a buyer. They’re also priced similarly to the Rio 5-Door, which starts at $13,600 for the LX ($14,700 with an automatic). Subsequent trim levels are priced at $16,500 for the EX and $17,700 for the SX. It’s astounding how quickly the sub-compact market is changing. 2010 models are already easily outstripped by the 2011 and 2012 up-and-comers. The proof is in the body of competitive small cars – in both hatchback and sedan styles – that deliver more performance, comfort, and technology than ever before. The best part? They’re still reasonably priced. 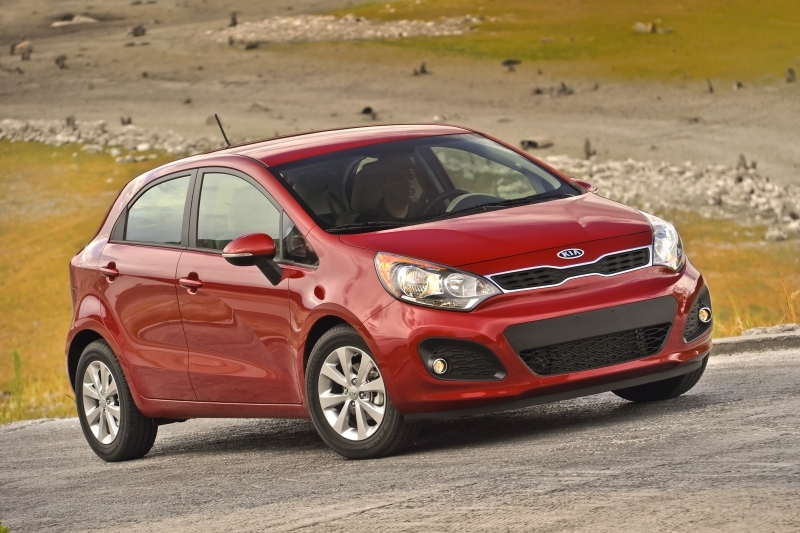 The Kia Rio 5-Door may not be the best of the bunch especially in performance, but certain aspects of it (price, technology features, design) will please many buyers.